LodgeiT is your all-in-one, multi-functional compliance platform designed to provide accurate, superfast tax form preparation and lodgement. Our goal is to make life simple and easy for accountants and bookeepers doing tax returns for clients - as well as people who need to lodge company, trust, or partnership tax returns. Integration with a range of accounting systems including Xero and QuickBooks Online, removes the need to re-key data. Simply connect the accounting system and press import. LodgeiT will help you take care of the rest with smart workflows, dynamically prepared working papers and automated report generation. Learn about LodgeiT's research and development on business.gov.au here. 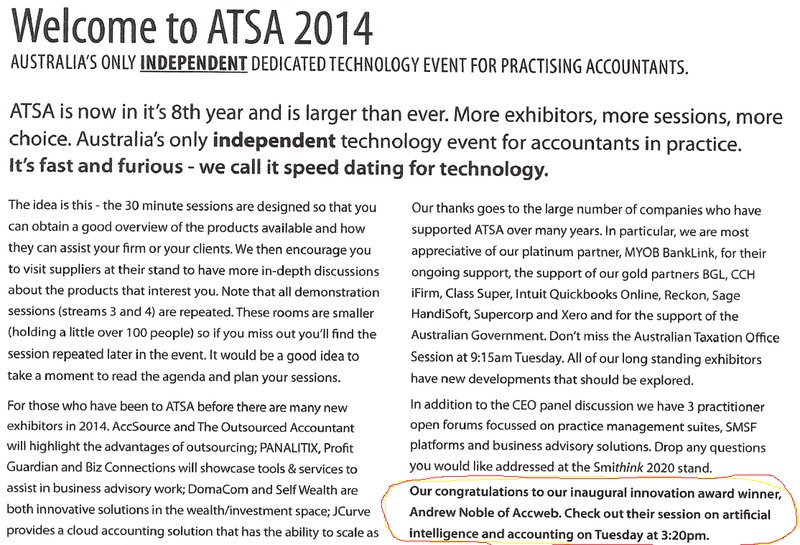 The unique LodgeiT approach to handling the classification of imported accounting data was recognised by ATSA, Australia's premier accounting technology event where LodgeiT won the 2014 Innovation Award. Read more about the LodgeiT Artificial Intelligence Project covered by the Financial Review here. LodgeiT was one of the first Standard Business Reporting Platforms available and this is evidenced by the fact that LodgeiT includes forms for the 2011 financial year. Lodgeit has been designed from the ground up by accountants and is maintained by seasoned tax professionals. Powerful automation helps you build financial reports & fill tax forms fast, saving time & money. Error correction technology prevents you from submitting incorrect information. Hints and tips provided by tax professionals ensure you never pay too much tax. LodgeiT requires minimal training. Where training is required, we offer a suite of video. All ATO Forms from 2011 to date. LodgeiT is built on the Amazon cloud and undergoes regular penetration testing. Here's a few of the many other business that trust us to deliver. "Before LodgeiT I'd waste hours manually entering data into returns." LodgeiT enters all the prefill information into all the right labels for me plus works seamlessly with QBO, Xero and all versions of MYOB so now I can make a decent profit doing compliance because it’s accurate and efficient. You can tell it was written by a real tax agent and not just another software company. If you’re thinking there has to be a better way, there is. Try LodgeiT, I promise you’ll be pleasantly surprised – I was. "We used to have a disjointed, multi-step manual process that was extremely time consuming." LodgeiT provides an end to end automation solution freeing us up from manual regurgitation of data and allowing far more time to add value to our clients. If you don't have anything better to do than regurgitate what your client has already done, you'll soon be redundant.